The Advisory Board of the Nigeria Prize for Science and Nigeria LNG Limited (NLNG) Thursday announced three research works as joint winners for the 2017 edition of the prize after two years intensive search for innovations in the fight to end Malaria. The award comes with a cash prize of $100, 000. The announcement was made by the Chairman of the Advisory Board for the Science Prize, Professor Akpoveta Susu at a press conference in Lagos. “Improving Home and Community Management of Malaria: Providing the Evidence Base” by Ikeoluwapo Ajayi, Ayodele Jegede & Bidemi Yusuf; “Multifaceted Efforts at Malaria Control in Research: Management of Malaria of Various Grades and Mapping Artemisinin Resistance” by Olugbenga Mokuolu; and “Novel lipid microparticles for effective delivery of Artemether antimalarial drug using a locally-sourced Irvingia fat from nuts of Irvingia gabonensis var excelsa (ogbono)” by Chukwuma Agubata were announced as the winning research works from 27 entries for this year’s edition of the prize. Reacting to the verdict, the General Manager, External Relations at NLNG, Kudo Eresia-Eke, said “This is not just a great milestone for the prize and NLNG. It is a great milestone for the people of Nigeria and Africa. Today’s result is two-pronged. Firstly, we finally have a winner for the Science Prize and secondly, we have some commendable research works that have contributed significantly to the body of knowledge on the disease and even provide some interesting opportunities for local approach to defeating malaria. It is truly a day to celebrate. But the hard work must not stop. The winners will need support to translate this to real benefits for Nigerians. We are calling on the government and corporate Nigeria to support this initiate and bring it to life,” he said. According to Professor Susu, “We acknowledge the difficulties associated with scientific research in developing countries including Nigeria, where infrastructure deficit could deal a debilitating challenge. Our hope is that the award of this prize would in its own little way, provide a spark that would reinvigorate the passion of our budding scientists in finding solutions to our everyday issues. “We congratulate the winners for a job well done and for achieving this feat in the midst of an impressive array of entries. This is indeed a call to do more so that the identified potentials could be realized,” he stated. He also announced “Innovations in Power Solutions” as the Advisory Board’s pick for 2018 prize theme. According to the judges’ report, the work “Improving Home and Community Management of Malaria: Providing the Evidence Base” was adjudged one of the winning entries because of its contribution to malaria in the community. The panel stated that the submission consists of many publications which systematically evaluated and demonstrated the feasibility, acceptability and effectiveness of artemether-lumefantrine (AL) – the ACT of choice in Nigeria for home management of malaria. On the co-winning work, “Multifaceted Efforts at Malaria Control in Research: Management of Malaria of Various Grades and Mapping Artemisinin Resistance,” the panel remarked that the work contributed significantly to the area of management of severe malaria and monitoring of molecular markers of artemisinin resistance. The panel also added that “Novel lipid microparticles for effective delivery of Artemether antimalarial drug using a locally-sourced Irvingia fat from nuts of Irvingia gabonensis var excelsa (Ogbono)” demonstrated how novel lipid microparticles can be effective for the delivery of artemether antimalarial drug using a locally-sourced Irvingia fat from Ogbono, which is grown in Nigeria. The number of entries for the 2017 edition exceeded the 2016 entry numbers of 15, showing increasing awareness and interest in one of Africa’s most prestigious science and technology prizes. 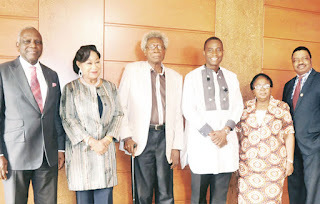 The decision on the winning entry of The Nigeria Prize for Science was reached by a panel of judges, led by Professor Catherine Falade, a professor of pharmacology, at the University of Ibadan. Other members of the panel include Professor Sunday Ene-Ojo Atawodi, Professor of Biochemistry at Ahmadu Bello University and Prof. Obioma Nwaorgu, a public health parasitologist and epidemiologist from Nnamdi Azikiwe University, Akwa. Other members of the Advisory Board for the Science Prize, besides Professor Susu, a past winner of The Nigeria Prize for Science, are Professor Michael Adikwu, Vice-Chancellor, University of Abuja and also a past winner of the science prize; Professor Elijah Mshelia, a nuclear physicist; Professor Barth Nnaji, renowned scientist and former Minister of Power; and Chief Dr. Nike Akande, President, Lagos Chamber of Commerce and Industry and two-time Minister. The first winner for the prize in 2004 was Professor Akpoveta Susu and his then doctoral student, Kingsley Abhulimen. In 2005, there was no winner. Professor Michael Adikwu won the prize in 2006. In 2007, as it was in 2005, there was no winner, however, in 2008, Dr. Ebenezer Meshida emerged winner. Professor Andrew Nok and Professor Akii Ibhadode won the prize in 2009 and 2010 respectively. There has been no winner since 2010.